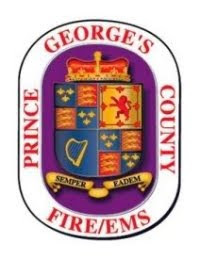 Prince George's and Montgomery County Firefighters were alerted to an apartment fire at about 5:17 pm on Wednesday, January 13, 2016. Public Safety Communications answered several 911 calls reporting a condo apartment on fire at 9205 New Hampshire Avenue in Adelphi. Firefighters arrived at 5:21 pm finding a 4-story in the front with 6-stories in the rear, center hallway, flat roof apartment building with fire showing from the top floor. Two occupants next to the apartment of origin had tried to escape through the hallway but were driven back into their condo due to the intense heat and smoke. They retreated to their balcony where they were rescued by firefighters from the Chillum-Adelphi Fire/EMS Station 834 using their extended ladder from Truck 834 to reach and rescue the two trapped occupants. An open hallway door of the apartment of origin created a flow patch that generated intense flames and extension of the fire into the main hallway. The fire also quickly extended into the flat roof structure. Firefighters attempted entry onto the 4th floor hallway but were pulled back to the safety of the stairwell as a deck gun was used to knock down a bulk of the fire from the exterior. Firefighters re-entered the 4th floor to conduct searches and extinguish the fire. It required 30 minutes to extinguish the bulk of the fire with another 20 minutes to completely extinguish the fire. In addition to the 2 occupants rescued by Truck 834 another occupant was ushered off of the third floor by firefighters from Branchville. This occupancy dropped from a 4th floor balcony to the third floor and was assisted out through the main stairwell. He was evaluated by medics but did not appear to be injured. Two occupants i n the apartment of origin sustained burn injuries and were transported to a Burn Unit. They were in good condition and expected to be treated and released. The incident did escalate to 2 alarms which sent over 25 fire/EMS and support vehicles to the scene. There were about 90 Prince George's and Montgomery County firefighters and EMS personnel on the scene. The cause of the fire remains under investigation. At this point in the investigation nothing has been found out of the ordinary or suspicious. Fire loss is estimated at $200,000. There are 40 condo units in the building. All 40 units, 101 residents, were displaced with many making their own arrangements. Four units, 10 residents, required assistance from the American Red Cross with temporary shelter. There were a total of 2 civilian and 3 firefighter burn injuries. All were treated and released. The video seen is from a media helicopter piloted by Brad Freitas, he arrived just minutes after our initial arriving units and captured a rescue from the 4th floor by Truck 834 and the intensity of the apartment fire.